That moment when you’re walking across the crosswalk at Olive and 6th, buried in your phone, and you look up to find yourself enveloped in an iridescent, shimmering cloud. As of yesterday, that’s what’s happening at Pershing Square in Downtown. Never mind that the park itself is almost universally despised and due for a makeover, a new art installation has introduced a touch of the sublime. 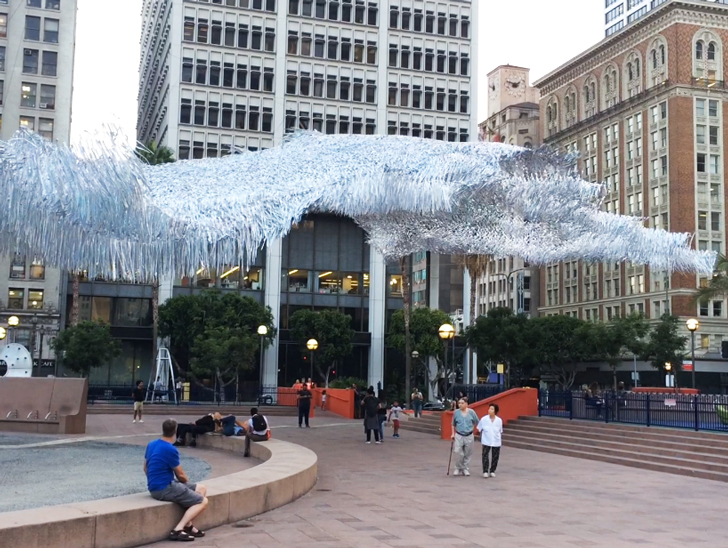 Called “Liquid Shard,” the cloud is made from thousands of strands of holographic mylar, all tied to a net strung from Pershing Square’s blocky purple bell tower to the western corner of the park. When the wind blows, the whole canopy billows on the breeze like a school of airborne fish, rising and falling in waves. The sculpture was designed by Patrick Shearn of Poetic Kinetics—the installation art wizards behind that massive butterfly at Coachella—in tandem with AA Visiting School Los Angeles—a short term study program for architecture and design students. It will remain aloft through August 11. Next articleWhere to Find the Best Regional American Barbecue in L.A.